As I've said before, Fabergé made many, many little animal miniatures out of precious materials, and here is one more of those - a parrot on a perch! Made by workmaster Mikhail Perkhin 1903! This little parrot is carved from agate, and has eyes of rose-cut diamonds. It is resting on a perch of gold, decorated with white enamel and diamonds. It's dimensions is 5.7'' x 2.8'' x 2.4'' (14.5 x 7.2 x 6.2 cm). The bird was bought by King Edward VII in 1907. His wife Queen Alexandra was very fond of parrots, and several photos from her days show that she kept several birds, in both cages and on perches, in her dressing room. 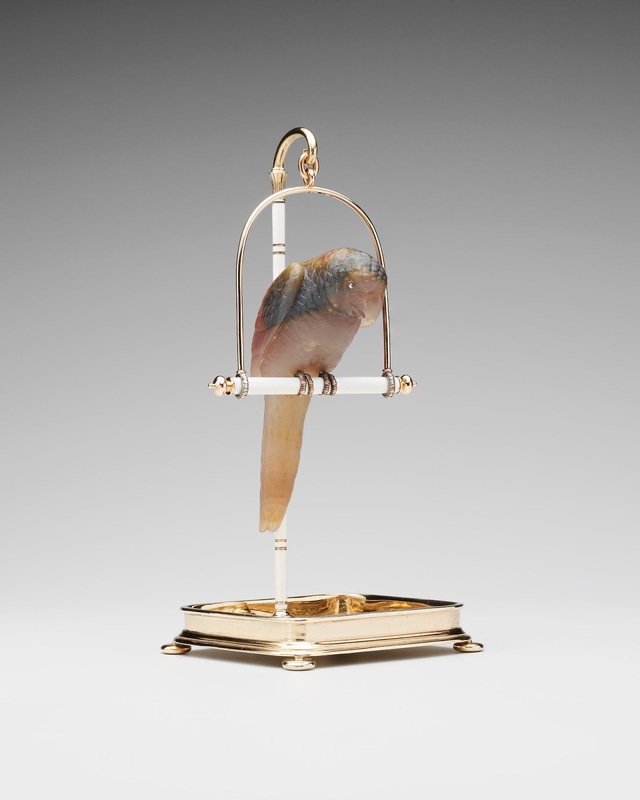 Now this Fabergé parrot is perching in the Royal Collection though.